By Joan Martinez-Alier. Latin America has turned to local referendums in mining conflicts. The precursors include Tambogrande in northern Peru, and Esquel in Patagonia in Argentina a little over ten years ago. Although the legal validity of such referendums is not always recognised, they were effective in stopping gold projects. “Yes to agriculture, no to mining”, was said in Tambogrande, an irrigated valley of the Peruvian coast. Other slogans were: “yes to life, no to mining”, “yes to water, no to gold”, depending on the location. The examples of Tambogrande and Esquel were transmitted by video and supported by networks such as the Mining Conflicts Observatory in Latin America (OCMAL) and by the web page which was born in Esquel, “No a la Mina”. They are not NIMBY cases but manifestations of popular and indigenous environmentalism, local expressions of the global Environmental Justice movement. Confronted by the inhibition of the authorities towards the protests and their acceptance of bribes offered by mining companies, we see that local inhabitants exhibit a proud sense of democracy sometimes reinforced by feelings of indigenous identity. Direct action is used, marches and strikes, but also local consultations. Thus, in June 2012 there was a referendum in Loncopué (Neuquén, Argentina), which was won with 84 per cent opposing open pit mining. A current case is that faced by the Kañaris community in Ferreñafe, Lambayeque (Peru) who mobilize against the junior Canadian Candente Copper company and against the Peruvian state. This Quechua-speaking community were possibly ancient mitimaes. The Cañariaco Norte project involves an investment of 1.5 billion dollars and 110,000 tonnes of copper per year for 25 years. On September 30, 2012, the villagers (male and female) from the different villages of San Juan de Kañaris, attended a community consultation. A previous meeting (favourable to mining) had recorded low participation. The final publicly released result was 1,896 participants (about half of the census), of which 1,719 voted against the project, 106 in favour, and 71 blank and null votes. They did not apparently appeal to the ILO Convention 169 but instead simply to local democracy. The consultation was witnessed by the national police and support organisations: the National Confederation of Communities Affected by Mining in Peru (CONACAMI), the MUQUI Network, the so-called Command Control Unit of Lambayeque. The Ministry of Energy and Mines ignored the results despite the Director of Energy and Mines of the Lambayeque Region attending the referendum. The result was also rejected by the Candente Copper company and its CEO, Jeanne Freezea, who announced that it would continue with the exploration of copper, gold and silver in the Kañaris lands. Meanwhile, the community president requested that the wishes of the community expressed by secret ballot in this consultation be respected. In late 2012 there was a roadblock and a temporary kidnapping of three geologists; forms of action performed the world over. On December 17, 2012, in a tug-of-war, the community suspended protests until presentation of the conclusions of the dialogue with the authorities. 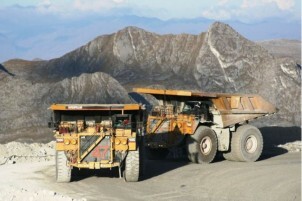 The company offered the neighbouring community one million shares once construction of the mine would start. The price of these shares on the stock exchange ebbs and flows with the news coming from Ferreñafe. On January 11, 2013, the president of the community, Cristóbal Barrios, announced the decision of almost four thousand villagers to restart protests against the mining project, if it were not permanently closed within this month. On 21st January the police threw tear gas against demonstrators approaching the Candente Copper mining camp, on the following day a general strike was declared in San Juan de Kañaris, where there is much tension.